There are onions, and then there are the onions of Giarratana, Sicily. Huge and sweet, they are often eaten raw in salads or used as an edible spoon to scoop up mouthfuls of cooked fava beans. They are also excellent when used as stuffing in focacce, simply grilled or baked with various condiments. They appear in the markets in July and August, and only grow on about 30 hectares (75 acres) of land around Giarratana, an untouristed small town in the province of Ragusa in southeastern Sicily – most of them are sold or consumed at the annual festival, the Sagra della Cipolla. 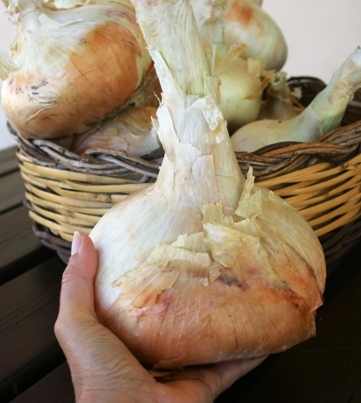 We got a good supply of Giarratana onions as pre-festival gastronomic training for our stomachs before we spend several hours gorging on onion-based dishes at the Sagra della Cipolla in mid- August. With thick white flesh and paper-thin golden skin, they’ve got a flattened shape like a pudgy Frisbee and are often sold with a long stem so they can be stored by hanging in a cool dry pantry. The “smallest” onion in our 20 kilo (44 lb) crate weighed in at a little over 500 grams (1 lb.) and the largest was a humongous fellow that tipped the scales at 1.3 kg (nearly 3 lbs) and was roughly the size of a Vespa tire. To prepare cipolle di Giarratana, here are some cooking techniques and a recipe. You can also use “regular” white onions for the roasted onion recipe, as any harsh onion taste will dissipate during slow cooking. Take a small Giarratana onion, and bury it in the hot coals/ashes of a wood fire. Let it cook for about 30 minutes, dig it up and scrape off any burned bits. Anoint with oil and salt, and eat. Cut a a Giarratana onion into ¼” slices, dip in olive oil and roll in dry breadcrumbs that have been seasoned with salt and good Sicilian oregano. Bake until almost tender when pierced with a fork. Sprinkle with grated caciocavallo or parmigiano cheese, drizzle with a bit of olive oil and place in a hot oven or under a broiler to brown. This simple dish works well with regular onions, too. Cut an onion into fourths (or smaller if it’s a huge Giarratana onion), drizzle generously with olive oil and bake at 180° C (350° F) for about 1 hours, turning the onions occasionally so they’ll cook evenly. Turn the heat up for the last 10-15 minutes so they get brown and caramelized, but be careful not to burn. Transfer to a serving dish, sprinkle with salt, a little vinegar and add big spoonful of rinsed salted capers and a bit more oil. Mix together. Serve as a side dish to grilled meats or savor it all by itself, sopping up all the juices with crusty bread. Giarratana is a pleasant Baroque town off the beaten track, about 20 km from Ragusa in eastern Sicily. The annual onion festival takes place on August 14. I just printed your recipes so that I can try something else with these fabulous onions. I liked the town of Giarratana also although we just drove through on our way to Chiaramonte Gulfi. It looked quite nice. Thanks again for the onions. I will never be able to repay you with something equally wonderful. Hope the onions turn out well-it’s hard to go wrong with these lovely beasts. I enjoyed sending them to you, as their size is always surprising & lots of fun. How do they compare to Vidalias? 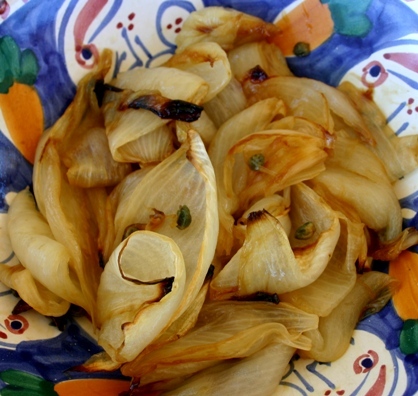 Since Vidalias are a sweet onion, I think they would be the perfect substitute for cipolle di Giarratana, particulary for the baked onions roled in breadcrumbs. But Vidalias can’t beat the Sicilian onions for their amazing size! Just found these at the Trionfale market in Rome and looking for a recipe I found your blog. Thank you! Let me know how your onions turn out! For our Thanksgiving Dinner I was looking for something different to do with my little white onions. I am going to try your way with the capers, after roasting them. Roasting small white onions should work well- you can even leave them whole. Let me know how these turn out and happy Thanksgiving! Hi Lyn, As far as I know these onions are not available in the US. YOu can subsitute Vidalia onions in the resipes, as they have a similar taste…or come to Sicily to taste these from Giarratana! I wish I could find the seeds. I’d love to grow some here in Rhode Island. Very difficult to find seeds from Lazio and Campania, my ancestral home land. Though, I have the opposite of a green thumb is…every plant I touch dies. I know they are not found outside of Italy. I know cause I have been trying for a long time to find seeds. Expecially seeds from lazio and campania, my ancestral home land. I’ve searched for many years, I have only ever seen Giarratana offered for sale once in the US. They were offered by the growitalian.com it was only a single year they had them and never had them since. Italian seed and tool had them the season after but never since. Finding Italian seeds if often difficult never mind the produce. The Giarratana I saw was sold. It was a 2 1/2 pound onion and it was bought for 25 dollars in Boston Mass. It was a little shop in Boston’s North end that also had traditional Salumi. $25 for one big onion – wow! I get a big bag here for about $6. I have just returned from my first trip to Sicily, amongst other things that stood out were the Giarratana Onions. I am a keen gardener and would like to grow these onions in Australia. Are you able to give me a link to where I could buy the seeds? It is difficult to get the seeds…..I managed to get some by asking lots of onion vendors at the annual festa. Don’t bother looking for seeds. Onions rarely grow from seeds anyway. But in the case of Giarrratana cipolle, you’d have to import a lot of soil since it’s the soil that gives them their flavour. They would not grow outside the soil of Giarratana, which is largely volcanic. I actually got some seeds from a grower in Giarratana, and they sprouted in a garden that is between Noto and Modica, so they do grow in othersoil, though perhaps not as large.